September 8 marked the 74th birthday of folk singer Declan Affley, who was born in Wales to parents of Irish descent. He joined the British navy at 16, and travelled to Japan and Australia; he jumped ship in Australia and based himself in Sydney. At a harbourside pub called the Royal George (now The Slip Inn), he discovered the libertarian movement known as the Sydney Push, and joined its folksinging scene. He became a regular performer in the folk clubs of Sydney and Melbourne, and appeared at folk festivals. He also busked on the streets, and was occasionally censored for singing left-wing political material, but this encouraged rather than deterred him. He was invited to sing some of his political songs on ABC radio, and also appeared in the 1966 award-winning ABC documentary, The Restless Years, presenting Australian history through poems, stories and songs. He also contributed to films, including the 1970 version of Ned Kelly. Declan regarded himself as a socialist with anarchist leanings, and was an active supporter of the New South Wales Builders Labourers’ Green Bans, Irish hunger strikers, and Aboriginal land rights. He taught music at the Eora Centre in Redfern as his contribution to the advancement of Australian Indigenous people. Irish people are often thought of as having the gift of the gab, and Declan loved to talk for hours about history, music, politics and sport over a beer. He died unexpectedly at the age of 45 – a very great loss to the folk community. The Declan Affley Memorial Award for excellence in a young performer is awarded each year at the National Folk Festival. Declan is an Anglicisation of the Irish name Declán or Deaglán; it is usually translated as coming from the Old Irish for “full of goodness”. The name is known because of Saint Declán of Ardmore, a 4th or 5th century Irish bishop credited with the Christianisation of southern Ireland before the arrival of Saint Patrick. 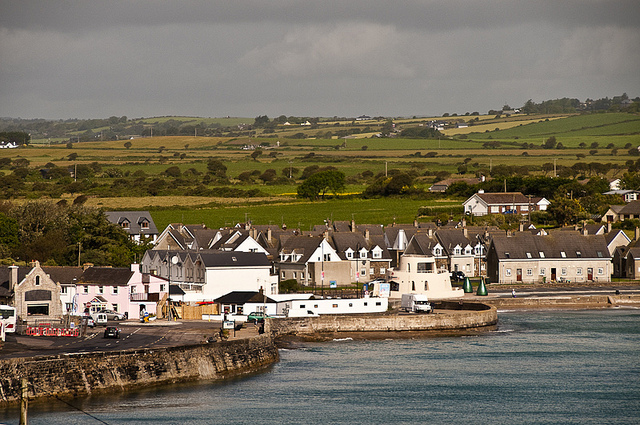 The village of Ardmore in County Waterford is believed to be the oldest Christian settlement in Ireland, and by tradition, Saint Declán built a monastry here. He has been steadily popular in Waterford, with many churches dedicated to him, and each year on his feast day of July 24, devotions are held in his honour. This year, a five-day pilgrimage walk was held in late July, on a 100 km path between Cashel in Tipperary and Ardmore, which Saint Declán is said to have taken. There is a long tradition of Christians taking new names, or being given new names, to mark their new lives, and in particular many of the Irish saints have created descriptive names. Declan looks to be one of them, for the meaning “filled with goodness” seems to have Christian significance. I can first find Declan in Irish records from the late 18th century, and they were all born in southern Ireland; in Munster, where Declan is the patron saint, and in Waterford, near his centre of Ardmore. That suggests very strongly that the name was given in honour of the saint, and that it had an element of local pride as well. Declan was quite a popular name in Ireland during the mid-twentieth century, and as well as Declan Affley, is borne by several musicians. These include Declan de Barra, an Irish-born Australian punk-folk singer, English pop singer Declan Galbraith who covers traditional Irish tunes amongst his own work, Declan Nerney, an Irish country singer, and Declan Sinnot, an Irish folk-rock singer. You may also have heard of Declan MacManus, who performs under the name Elvis Costello. Declan has charted in Australia since the 1980s, and ranked since the 1990s, when it debuted at #145. It has been Top 100 since the early 2000s, and last year it was in the top ten fastest rising boys names in Australia, when it rose 12 places on the national chart. Currently it is #84 nationally, #74 in Victoria, #60 in Queensland, #50 in Western Australia, #71 in Tasmania and #56 in the Australian Capital Territory. Unusually for a name in the national Top 100, Declan hasn’t been Top 100 in New South Wales since 2010. We seem to be caught between international trends, with New South Wales following the lead of England/Wales, where Declan has left the Top 100 and is declining in popularity, and Victoria and other states, who appear to be following the United States, where Declan is still rising towards the Top 100. Declan has a similar popularity to us in Scotland, but isn’t Top 100 in either Ireland or Northern Ireland. If you love the name Declan, you won’t find yourself alone in your preference, but it’s still a good Irish heritage choice. It’s a handsome name, with an attractive, lilting sound to it, and it’s not wildly popular. Brooke from Baby Name Pondering chose it as her favourite boys name in the Victorian Top 100, and tells me that she finds it really charming – great recommendation! POLL RESULT: Declan received an approval rating of 70%. People saw the name Declan as a good Irish heritage choice (25%), handsome or attractive (23%), and sweet and charming (11%). However, 11% thought the name was too trendy, and destined to be the next Aidan or Liam.